Exhibition - "Object Lessons: American Still-Life Painting in the Nineteenth Century"
Still-life painting was popular with many nineteenth-century American artists and viewers. Pennsylvania, in particular, has a rich tradition of specialists in still life. This exhibition features works by skilled still-life painters identified with the Commonwealth, notably William Michael Harnett, Albert F. King, Rubens Peale, John Frederick Peto, and Severin Roesen. 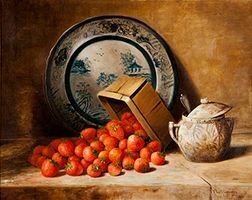 Object Lessons also includes a varied roster of important artists who gravitated to depicting inanimate objects amid the rising commodity culture and cosmopolitan networks of the Gilded Age, among them William Mason Brown, William Merritt Chase, Charles Caryl Coleman, Martin Johnson Heade, and Elihu Vedder. Surveying the early chapter of still life in America through twenty-two paintings, this exhibition reflects on the close scrutiny and meaning of commonplace things. Rarely seen loans from private collectors complement the holdings of the Palmer to explore how flowers, fruit, and simple household objects have transfixed and beguiled viewers from the nineteenth century to the present day.